Low Cost Luxury Living is accomplished most effectively and efficiently by not purchasing (or insuring or maintaining or paying property taxes on) a house (or condominium) or renting an apartment (or motel room). Low Cost Luxury Living is accomplished comfortably by fully utilizing what most of us already own, insure, and maintain and do not have to continuously pay property taxes on or monthly fees for. That is, our mode of transportation; that is, our vehicle. 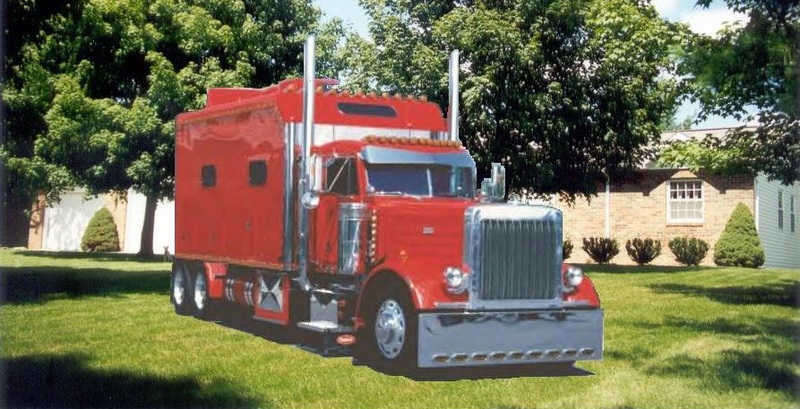 Most Long Distance Truck Drivers live in their trucks as the author did while owning and operating a semi as described on the web page at North American Van Lines Owner/Operator Semi Truck Drivers. 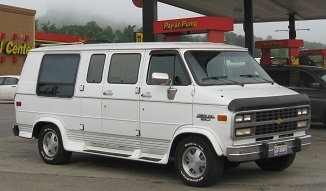 He has also lived on several Worldwide Oil Exploration ships as described and shown at Kirsten Bravo, Olga Bravo, and Western Horizon and had also lived in several apartments, a 5th Wheel camper, as well as a garage as described and shown at 1969 Camaro SS Restoration. The author has been a Consulting Software Engineer for many years, as described on his business web site at TDBConsulting.org, and enjoys working on a variety of projects for a variety of companies throughout the country. When working away from home, the author experimented with living in hotels, campgrounds, and was offered to live in company apartments. 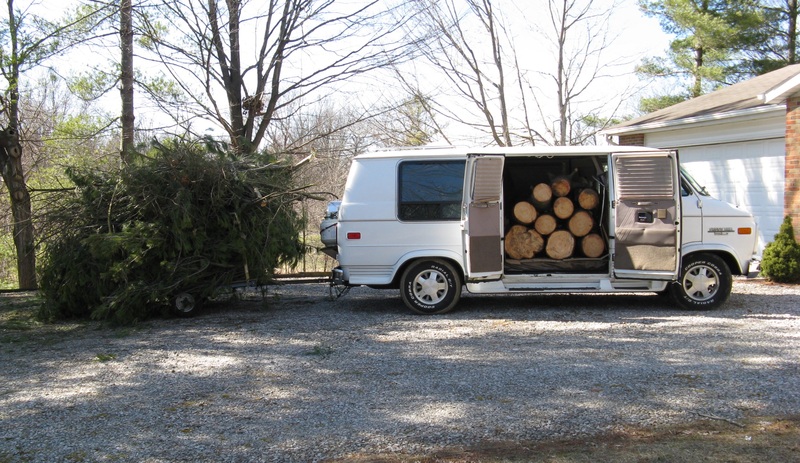 However, it was quickly learned that the most efficient (close to client company), effective (can be at work in just moments to observe progression of tests running over night), and comfortable (no traffic jams etcetera) is to simply sleep in his comfortable conversion van. Low Cost Luxury Living requires a person who is "self-sufficient, intelligent, and brave", precisely as the young lady describes at WHAT WE ARE. It also requires a reliable, enclosed, and secure vehicle. The sections below give details about the vehicle, interior, furnishings, and equipment required for Low Cost Luxury Living. Virtually any reliable, enclosed, and secure vehicle will do for Low Cost Luxury Living. 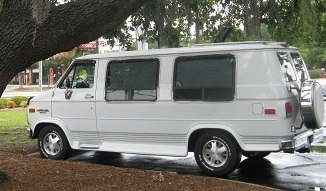 A conversion van of standard height (approximately 79 inches, and is 84 inches (i.e. 7 feet) with roof vent protruding 5 inches above roof) has proven to be excellent and will go anywhere, including inside residential garages and low clearance public parking garages. As an experiment, a 1984 Buick Regal was lived in for over a month and it too was quite comfortable after removing the passenger and rear seats and placing half inch plywood on the floor with foam padding on top. Almost everything is stored in the trunk, which is easily accessed from the passenger compartment with the back of the back seat removed. Invest in a reliable and rust free vehicle. The interiors of some vehicles (e.g. vans) are not finished from the factory and may be finished however the owner desires. Before beginning, visit lots of Recreational Vehicle Sales showrooms to get ideas of what features are preferred. It has been shown that there is no need for a sink or stove or oven or refrigerator or anything like that; nor has there been a need for an electrical or water hook up or anything else. Constantly keep in mind that any weight added to the vehicle will reduce gas mileage (i.e. increase fuel consumption and other costs) and increase wear on the driveline (i.e. engine, transmission, drive shaft, and rear axle assembly), suspension, steering, brakes, and tires. Heavy items should be mounted as low as possible to keep the vehicle center of gravity as low as possible for maximum stability. A roof vent with fan is an absolute must to exhaust heat (or fumes) on hellishly hot days. It is bolted to the roof above the bed and optional bench. 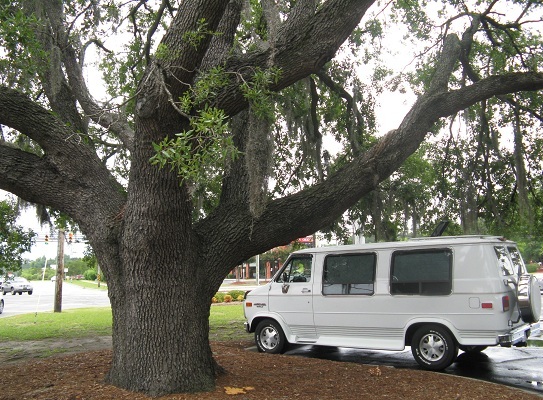 To conserve power for the fan on hot days, park the vehicle in the shade. Additional windows may be added where desired. Ensure they are properly installed. Any electrical wiring may be added as desired. Ensure it is properly installed. Note that after the finished walls and carpet are installed, wiring may be inserted along the bottom of walls at the edge of the carpet. Ensure the wiring is properly protected to prevent short circuits. Before installing the ceiling and wall coverings, be sure to clean and rust proof the lower portion of the walls well, especially in the cavities that can be accessed below the floor line. Then insulate and sound proof well with styrofoam or other type of light weight insulation. 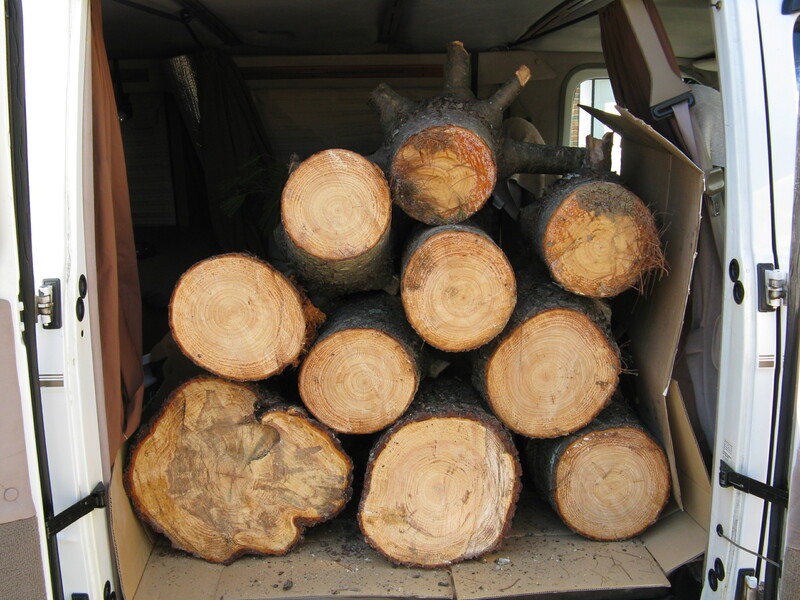 Durable light weight materials, such as as quarter inch oak, birch, or lauan (i.e. Philippine mahogany) plywood, should be used for covering the walls and ceiling. The surface may then be finished as desired. If the vehicle is not equipped with carpet, 3/4 inch styrofoam may be placed on the steel floor to produce an insulated sound proof flat floor. Wall to wall carpet is then properly installed. Clear carpet protector should then be installed over the carpet where required. To safely secure and store many items, it is convenient to have a securely mounted bed. Half inch plywood is used with 2 x 4 inch framing laid flat against the plywood, which is 1.5 inches narrower than the frame to create a 1.5 inch wide and half inch deep relief along the top long outer edge. Legs that are the same length as the height of the wheel wells are mounted on all four corners and at the center of the edge opposite the wheel well. The bench serves as seating for guests as well as an ottoman for those sitting on the bed. 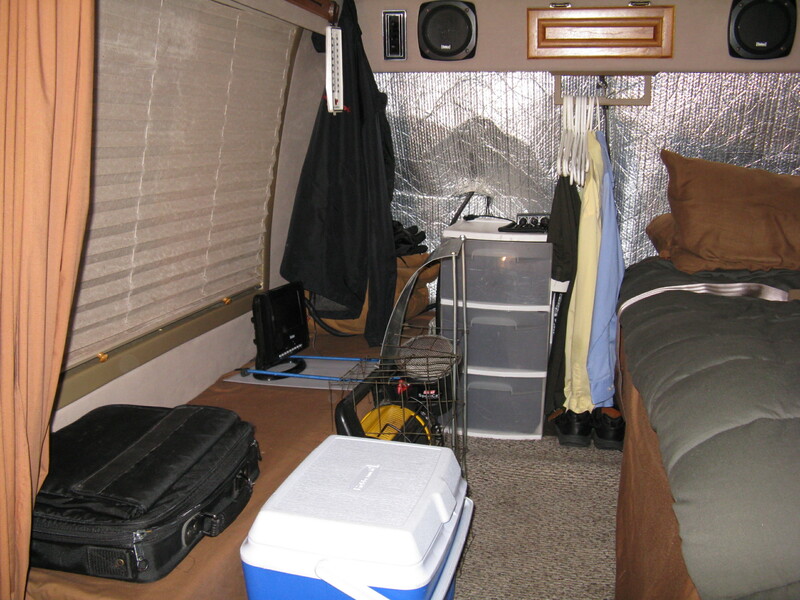 The open area between the bed and bench allows long and tall items to be loaded from the rear doors. This includes items such as a 12 foot canoe or kayak or 12 foot lumber and 4 x 8 sheets of plywood stood on the long edge. 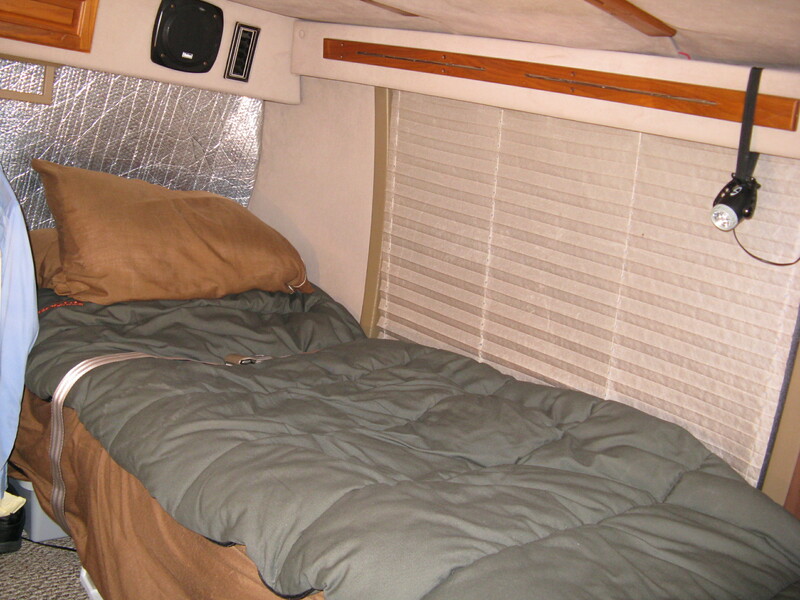 The size of the bed can be increased to the entire width of the van by inserting a removable 27 inch wide section of plywood between the bed and bench, which have the 1.5 inch wide and half inch deep relief along the top long outer edge. The top of the rear wheel wells to the floor is approximately 10 inches. Therefore, the height of the low profile tool box and drawers and large dishpan reserved for changing engine oil, which are placed under the bed, should be no more than approximately 8 inches high. If you require or desire the tool box and drawers to be higher, construct the bed and bench accordingly. This is cut precisely and neatly to fit over the windows tightly. 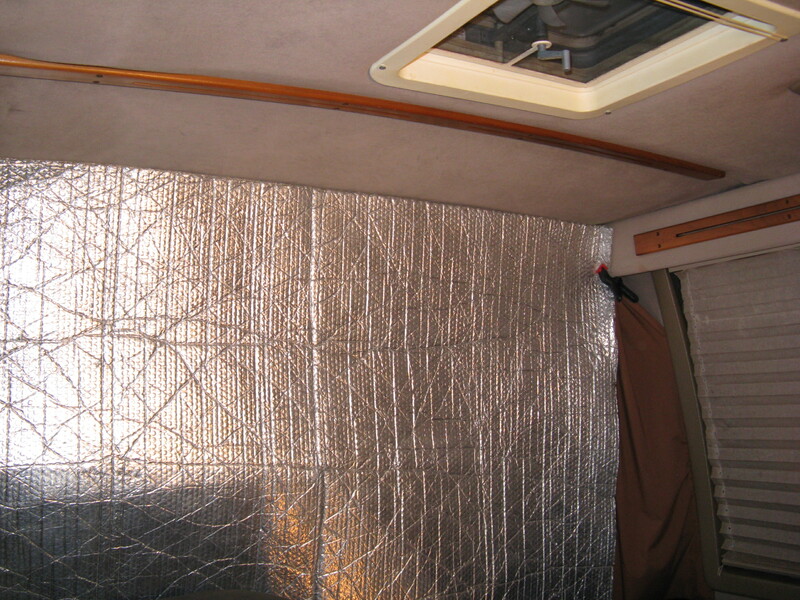 It serves for privacy and to insulate the vehicle from extreme heat or cold. Styrofoam fit over that may also be used for additional insulation and sound proofing. These are put over the carpet protection and can be easily removed and cleaned by simply shaking. Foam padding or air mattress as thick as you personally prefer is used for optimal comfort. All bedding is color coordinated. These are used for storing canned goods and other items and are placed under the bed that is held securely in place. This is placed next to the bed and used for storing folded clothes, towels, swimming trunks, receipts, pens and pencils, stationary, Pepper Spray, Long Sheathed Knife, Flashlight, and other items. It must be held securely in place. These are hung from the Color Coordinated Bungee Straps to provide privacy. One is normally hung behind the front seats from ceiling to floor. Another may be used as a room divider that is hung at the end of the bed and bench from ceiling to floor. These are used to hang the Color Coordinated Privacy Sheets and clothes on hangers from and to hold items securely in place. 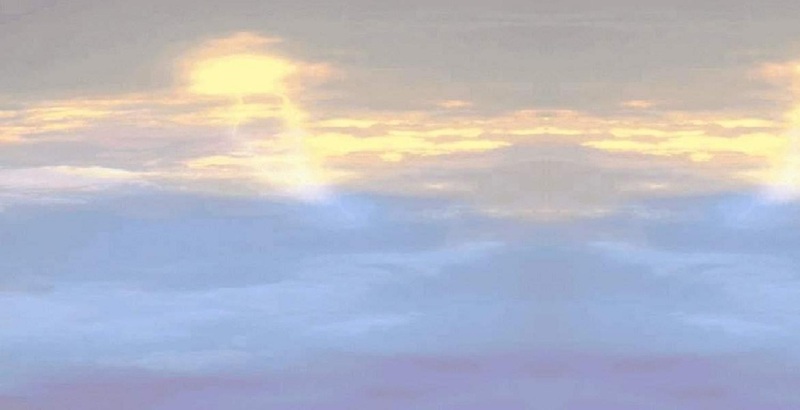 This is hung from a wall or the ceiling. This is used to hold jugged and bottled water, a can opener, and kitchen utensils along with any fresh fruit and vegetables. It must be held securely in place while driving. For indoor and outdoor use and must be held securely in place while driving. These serve not only as bath towels, but also to preserve and protect and color coordinate the factory vehicle seats and for turning aluminum lawn chairs into light weight color coordinated furniture. This is simply a color coordinated pillow case to hold laundry that needs to be washed. It may be placed wherever is convenient. The equipment required follows. PLEASE read, understand, and follow all safety instructions! The set of buttons above each image below allow you to Zoom In and Out of the image. Zooming is most effectively performed by clicking on 'ZOOM IN' or 'ZOOM OUT' and then pressing the enter key repeatedly as desired. This must be securely held in place and is placed in an easily accessable location to access when needing to jump start a vehicle or to have power wherever you like. 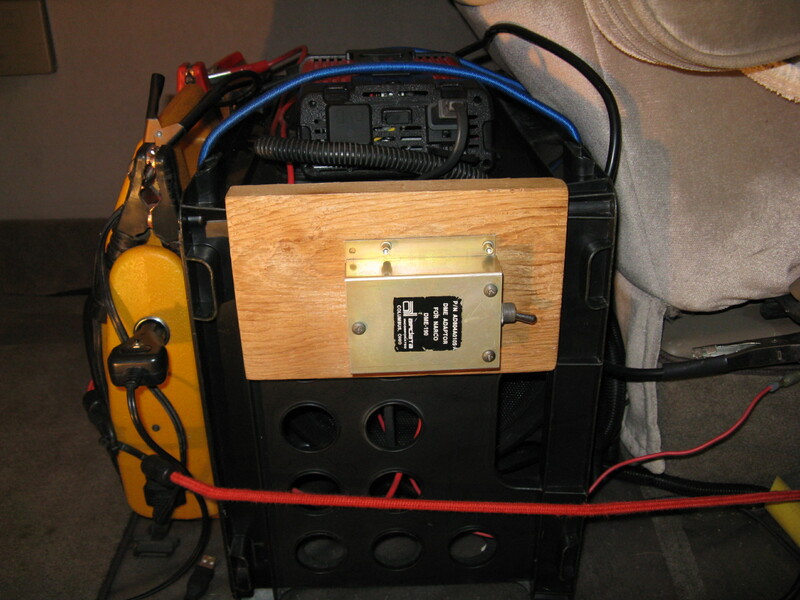 An Electrical Switch, such as that shown below (enclosed in a Foster Airdata Systems enclosure), is used to connect (switch up) and disconnect (switch down) the 12 VDC Portable Power Pack (left) to and from the vehicle battery. It is very important to not let the vehicle battery fully discharge because that reduces battery life considerably. While driving, make sure the Portable Power Pack is connected to the vehicle power and is being charged. 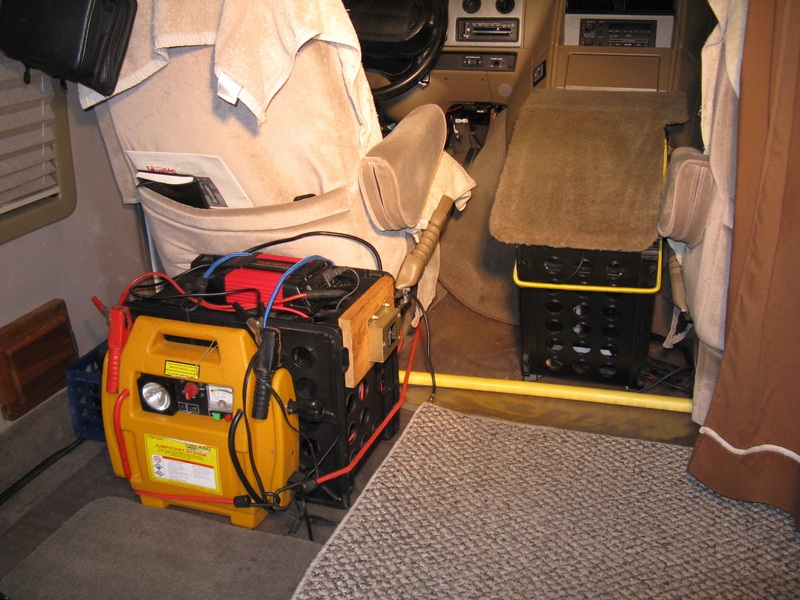 When lighting is needed when parked, a small 12 VDC LED light, connected to the Portable Power Pack and hung from the ceiling, is only turned on when needed. When powering the LED light, disconnect the Portable Power Pack from the vehicle power to prevent the possibility of the vehicle battery from discharging. 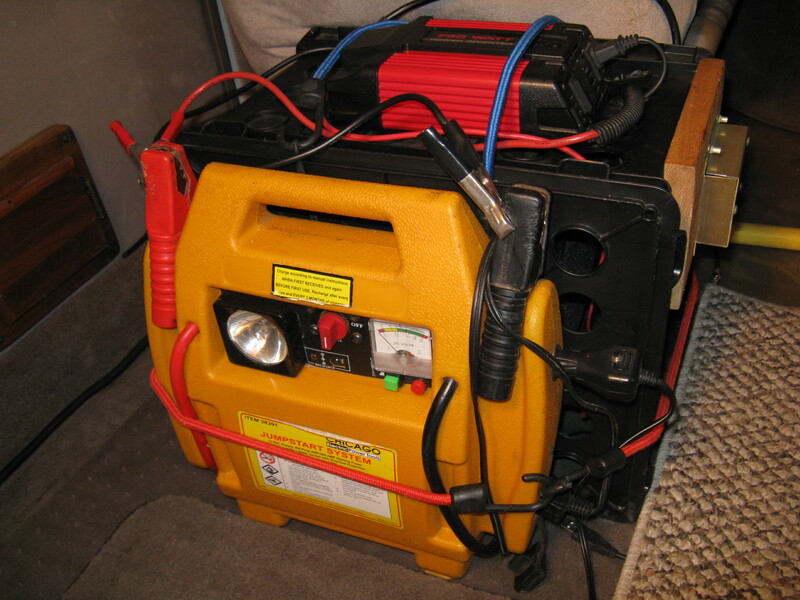 The Power Inverter is rarely used because it is normally nicer to use the 110 VAC power at the library with all of it's amenities, such as a fireplace or air conditioning. This must be securely held in place. A Portable Propane Heater of 1,500 BTUs and another of 4,000 and 9,000 BTUs will work well. For temperatures down to freezing (i.e. 32 degrees), the 1,500 BTU heater alone has been adequate. 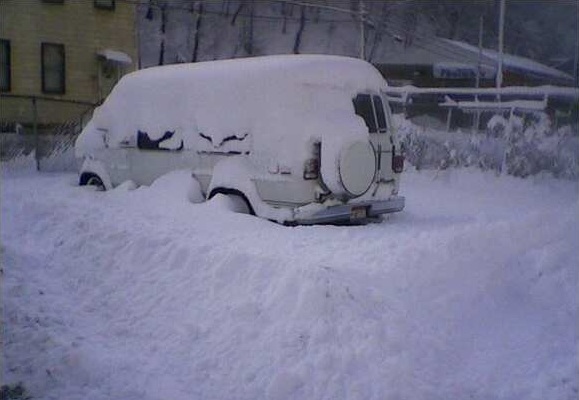 During sub-zero temperatures (e.g. 11 degrees below zero so far), the 4,000 BTU heater setting alone has been adequate. 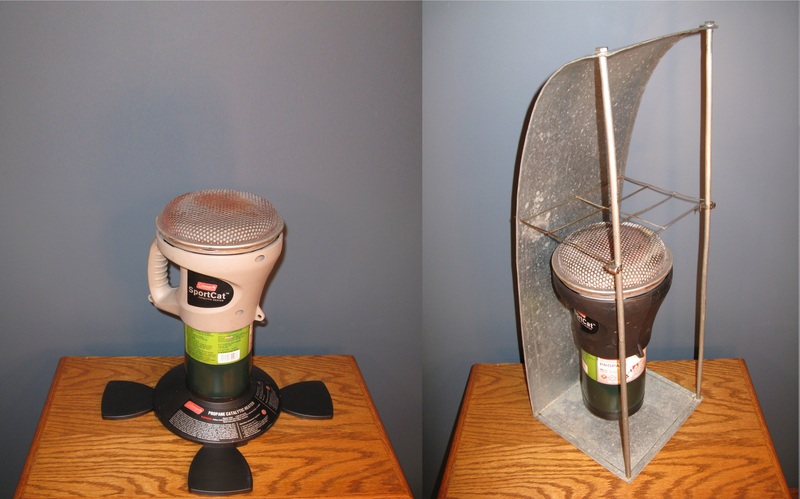 The photos below are of Coleman SportCat 1,500 BTU heaters for which one serves as a spare. The photo to the left shows one as provided by Coleman. The photo to the right shows one mounted inside a heat deflector that was designed and built by the author for additional safety and to allow items to be placed above the heater for warming and drying and for cooking. The heater handle is bolted to the back panel of deflector and a strap is strapped from the bench, around the deflector back panel, through the heater handle, and back to the bench. The photos below are of a Mr. Heater heater that includes a pilot light spark ignition, 4,000 BTU and 9,000 BTU settings, and low oxygen, pilot light out, and tip over automatic shut off systems. The photo to the left shows the heater as provided by Mr. Heater. 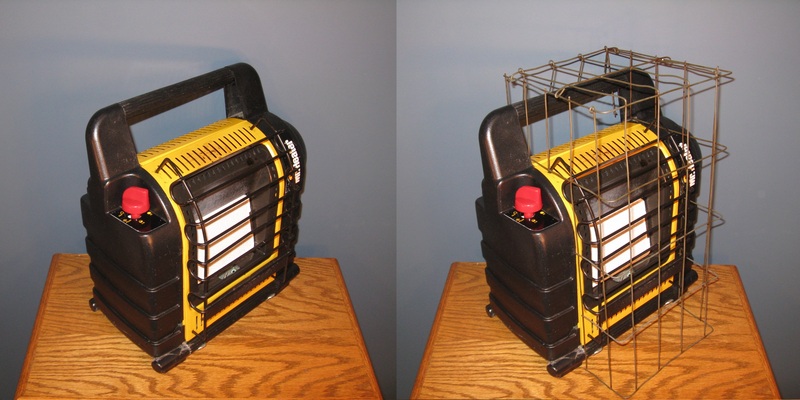 The photo to the right shows the heater with a safety cage that was designed and built by the author for additional safety and to allow items to be placed above the heater for warming and drying. 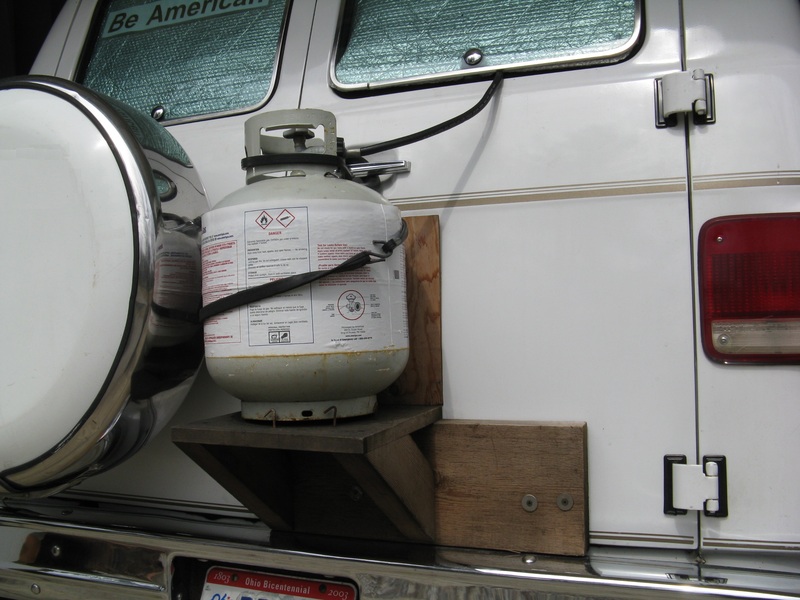 As shown in the photo below, a propane tank may be mounted to the back of the vehicle with the propane line connected to the tank, extending through the rear window, and connected to either the 1,500 BTU or 4,000/9,000 BTU heater. Note that a stainless steel chain and 2 rubber straps are used to hold the tank securely in place to the rear door handle and to the spare tire mounting bracket. During winter, you will need to have the tank refilled, or purchase a "Propane Exchange", about once a month. A "Propane Exchange" may be purchased at Walmart, The Dollar Store, or at many gas stations for about $20. Be sure to read, understand, and follow all safety instructions and have some ventilation while using heaters. The venting is needed not only to prevent running out of oxygen but to also help keep dampness down, which can be a problem when it is extremely cold. If you notice the heater going out or is difficult to light, it is possible that there is a low amount of oxygen in the vehicle. You can prove that by taking the heater outside and trying to light it there. If low oxygen is the issue, open a door for a few minutes. PLEASE BE EXTREMELY CAREFUL to prevent a blanket or anything else from falling onto the heater!!! It is wise to have a Smoke Detector and Carbon Monoxide Detector hung from the ceiling. WARNING! There was once a smell of smoke, after a corner of the blanket had dropped onto the heater, and both the Smoke Detector and Carbon Monoxide Detector failed to detect the smoke and fumes! The "Lesson Learned" from that was to always wrap the edge of the blanket that is against the wall down under the bed mattress to prevent the possibility of any portion of the blanket from falling onto the heater, which should always be on the floor and away from the bed. This is hung from the ceiling. WARNING! It has been shown that Smoke and Carbon Monoxide Detectors can fail to detect smoke and fumes! These are used to jump (i.e. charge) the vehicle battery, using another vehicle, and are placed under the bed. These should never be needed to jump your battery unless your battery goes bad or you failed to only power your LED light(s) using the Portable Power Pack, which should always be charging while driving. They may be used to assist others needing their battery jumped, but the Portable Power Pack proves to be most convenient for doing that. These are placed in the dishpan reserved for changing engine oil that is placed under the bed that is securely held in place. This includes ratchets with sockets and extensions, wrenches, screw drivers, pliers, utility knife, hammer, etcetera. This is placed under the bed that is securely held in place. This is used to ensure the spare tire and all others are always properly inflated all the time. This is placed in the low profile drawer under the driver front seat. These are placed in the low profile drawer under the driver front seat. These are very slow at inflating tires but may be needed in an emergency. It is nearly impossible to inflate an air mattress with one. This is placed in the dishpan reserved for changing engine oil that is placed under the bed that is securely held in place. These are very fast at inflating air mattresses and are also useful to blow dust and dirt out of hard to reach places when cleaning. These are not very effective and the filter needs to be cleaned often. This is one reason why Color Coordinated Rugs are used, which can be easily removed and cleaned. This is used to sweep any dust and dirt off the carpet protector. This is hung above the bed and only used when necessary. This is for indoor and outdoor use and should always be charged. This is used to be able to swiftly and reliably go wherever you want whenever you want and to reliably deal with detours. GPS Receiver include a searching feature to swiftly locate the nearest library, fitness center, auto parts store, grocery store, or virtually any other place of interest. This is also used when hiking. This is dialed to channel 19 to be able to swiftly learn about any traffic issues and to chat with other motorists. Channel 9 is reserved for Emergencies. Users typically have a "CB Handle" to identify themselves when talking on the CB Radio. The author's CB handle is "Skeptical". This is used to tune into weather and news and other entertainment. These are required to keep clean, warm, and dry while working on your vehicle, especially when it is brutally cold outside. This is required to perform virtually any repair required for your vehicle. If any special tools are needed, the fine folks at many auto parts stores will loan tools to you. Note that some identical items available at auto parts stores are also available at Walmart for much less. For example, Valvoline Motor Oil at Advance Auto Parts costs approximately $28 but the exact same Valvoline Motor Oil sells for approximately $17 at Walmart. That is a savings of $11 (28 - 17 = 11). This is used to read the vehicle computer self diagnostic codes to swiftly identify and repair vehicle malfunctions. This is used to measure electrical voltage, resistance, and current. These are required to keep the windows, interior, and your hands clean. 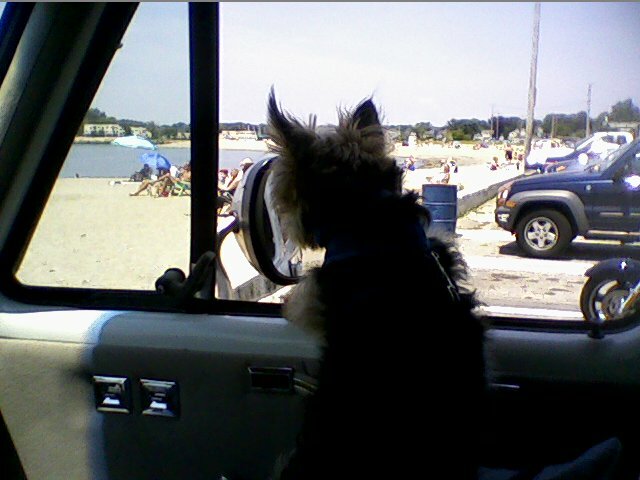 Clean windows greatly improve your ability to drive safely and to enjoy the scenery. This is kept under the passenger front seat. This is for self defense and cutting food and always kept nearby. This is for self defense and always kept nearby. This is for extinguishing fires and for self defense. 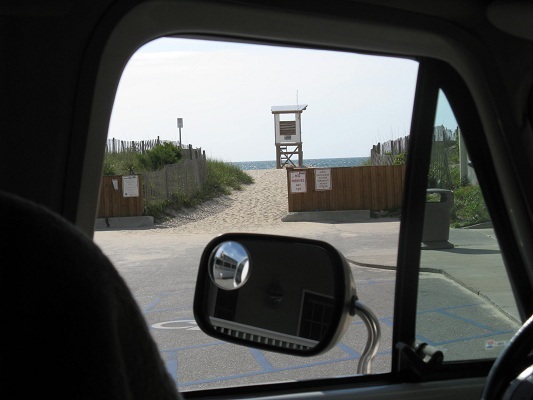 It is placed for easy and swift access and must be held securely in place while driving. This is for cutting firewood and for self defense. This is used to hold a small traveling case (for personal care and hygiene items) towel, and a change of clothes for after showering. This is absolutely positively a must and is used to record whenever the vehicle is fueled, when fluids or filters are changed, and when parts are replaced. Each and every time the vehicle is fueled, fill the tank full and record the miles and gallons and then calculate the miles per gallon (i.e. miles / gallons = miles per gallon) since the previous fill up. Increased fuel consumption (i.e. decreased gas mileage) can be an indication that there are issues that need to be addressed such as engine ignition issues, clogged filters, improperly inflated tire(s), sticking brakes, leaking fuel line, failing sensors, and so forth. Each and every time the vehicle has any fluids added or changed or parts changed, record the miles and date and then calculate how many miles and months since that operation was last performed. Increased fluid (e.g. engine oil) consumption is an indicator of worn parts (e.g. engine components). Always keeping the vehicle "clean and well organized" (as visiting Police Officers stated about the author's van) is strongly recommended. Notice that no firearms are mentioned for self-defense. This is because it has been shown that one is more likely to kill or maim themselves or someone else by accident with a firearm than by being mugged or robbed. If a firearm is necessary, please follow the NRA rules at: NRA Gun Safety Rules. Photographs of what Low Cost Luxury Living looks like on the outside and inside follow. The photo below is of the side entrance into the Foyer. Notice the light weight portable chair and the CD/AM/FM/Weather/MP3 player hanging to the right of the chair. The privacy sheets hung from bungee straps can be seen to the right and left to easily close off the front section (right) and/or the rear section (left). The foil bubble wrap insulation at the foot of the bed (left) encloses the entire rear section during sub-zero weather and has been proven to be quite comfortable down to 11 degrees below zero (so far) while using only the 1,500 BTU heater. 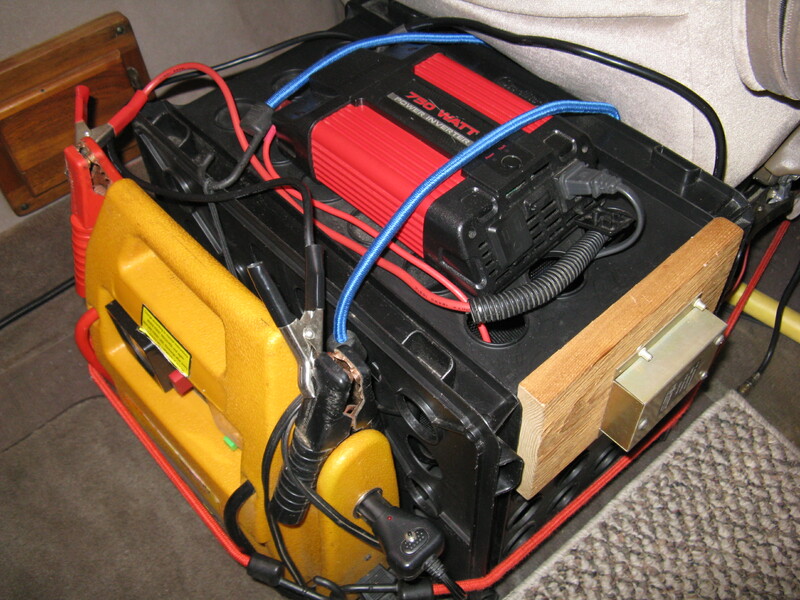 The photo below shows, behind the drivers seat, the 12 VDC Portable Power Pack (yellow) with the 12 VDC to 110 VAC Power Inverter (red) mounted on top of the protective enclosure (black) that the Sub-Woofer of the Stereo (to the right between front seats) is mounted within. 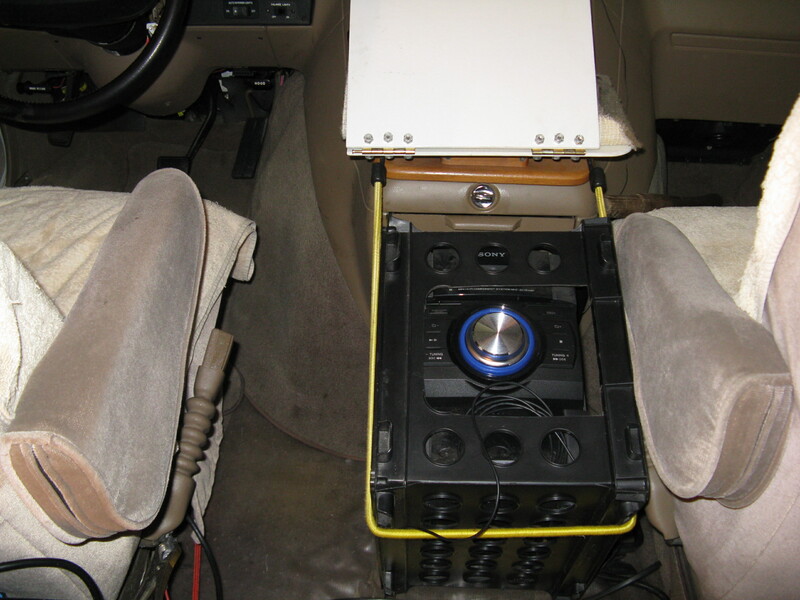 The photo below shows, between the front seats for easy access, the 540 Watt Hi-Fi Stereo mounted within a protective enclosure. The carpeted cover, that your pet will like to lie down on, over that protective enclosure raises to access the controls. The left and right speakers are located under the end of the bed and bench facing forward. Notice too the color coordinated bath towels that effectively preserve and protect the vehicle seats that remain in pristine condition. The photo below shows the bed under which are several low profile drawers. Notice the LED light, seatbelt (to be used when vehicle is being driven), and foil bubble wrap insulation that covers the entire back wall during sub-zero weather. Most importantly, notice that the opening of the sleeping bag is towards the heater(s), which should always on the floor and away from the bed, to prevent any portion of the sleeping bag from falling onto a heater if and when unzipped. The photo below shows the bench (left) upon which is the computer case, 12 VDC portable TV/DVD, overalls, gloves, and laundry bag. On the floor is the cooler, 4,000/9,000 BTU heater, 1,500 BTU heater, and tower of drawers upon which is the 12 VDC power strip to power the TV and LED strip, which illuminates the TV controls, and for charging the cell phone. The thermometer, jacket, and clothes hanger, behind which is the hook for belts (below which are shoes), can also be seen. The propane gas line, which can be seen protruding through the foil bubble wrap insulation just above the tower of drawers, is connected to the 1,500 BTU heater. 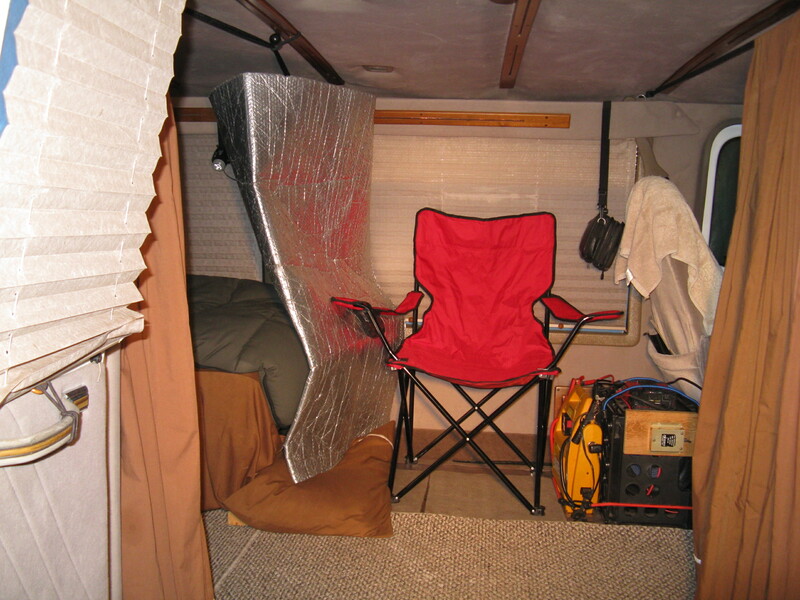 Notice too the blue bungee strap that securely and firmly holds the 1,500 BTU heater and portable TV in place. The photo below shows, from the rear section, the foil bubble wrap insulation that encloses the entire rear section. Notice the roof vent with fan that is an absolute must to exhaust heat or fumes (e.g. cooking, propane, etcetera). The rubber band is used to help hold two pieces of foil bubble wrap insulation, that are precisely cut to fit in the roof vent, that have a hole punched into so they can slide over the roof vent handle and be held in place. Being mostly Vegan, canned vegetables and fruit and protein bars and such are all that are needed. That is all stored in the low profile drawers placed under the bed that is securely held in place. Fresh fruit and vegetables are stored in the cooler. Whenever anything needs to be heated up, just peel the paper off the can and set it on top of the Portable Propane Heater for a few minutes. After work, you are free to experience all the "New Adventures" you like. The Driver's Lounge at Truck Stops (when one is in the area) can be nice to watch a movie at; especially now that no smoking is allowed. Some other no (or low) cost activities are described at No Cost Activities. 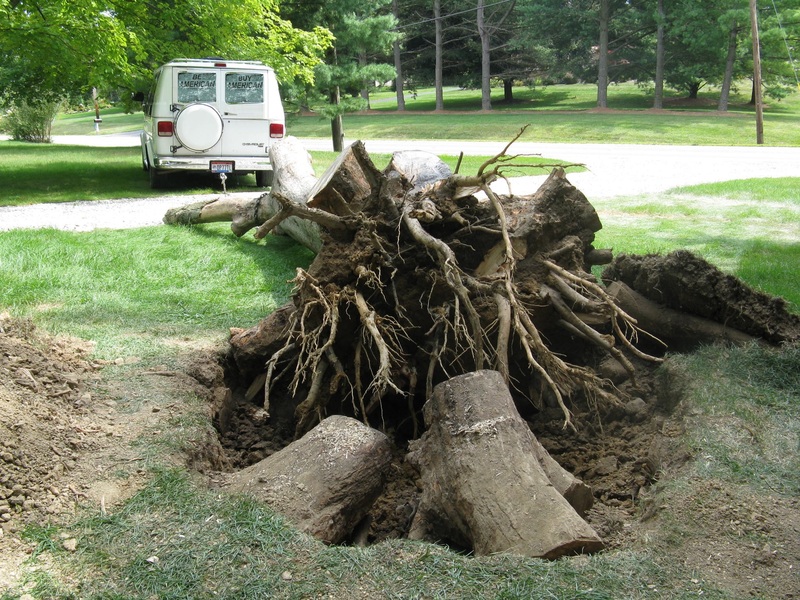 If you like, you can even make extra money removing trees (including the stumps and roots) that have been killed or blown over. 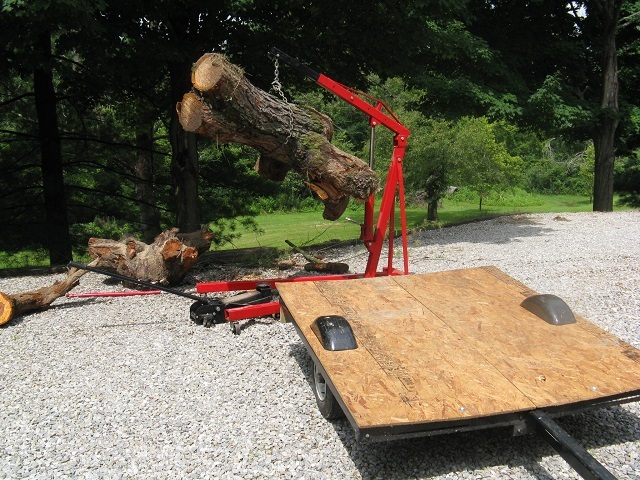 However, that will require that you purchase a large chain, chain saw, and shovel. You may even consider becoming a "Motivational Speaker" as in the video at: "Living in a van down by the river".. Convenient places to park and sleep include Truck Stops, 24 hour Shopping Centers (e.g. Walmart with the senior citizens), Rest Areas, 24 hour Restaurants (e.g. 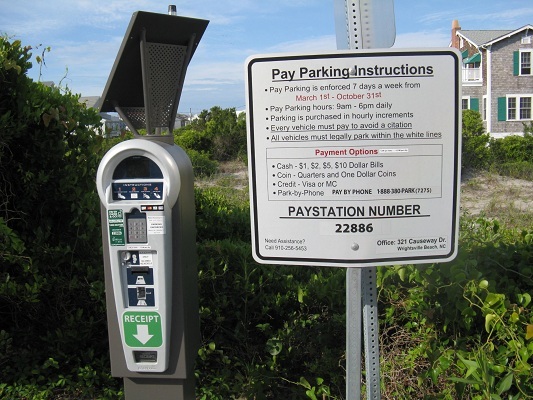 McDonalds), Libraries, some Gas Stations with large parking lots, or at the beach. It is best to park where it is well lit and also the least conspicuous. 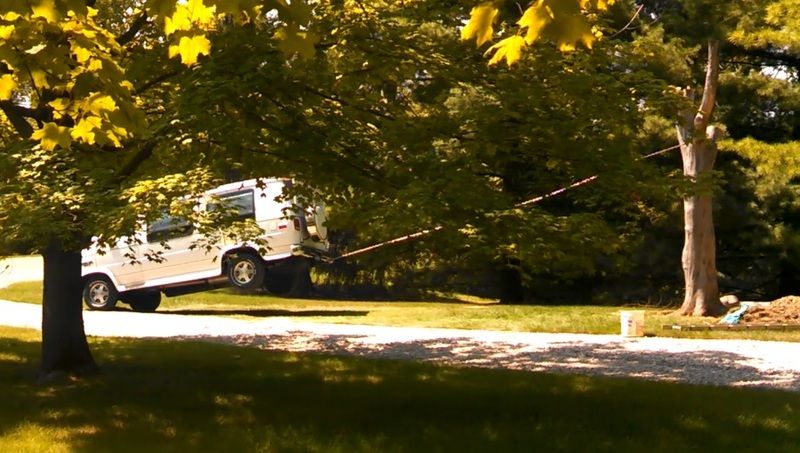 It is wise to rotate where parked overnight to avoid drawing attention. Showers can be taken at Truck Stops, Fitness Centers, and Community Centers, which can usually be located using the GPS Receiver. Many companies have showers along with exercising facilities, which are quite nice. Laundry is done at any conveniently located Laundromat, which can also be located using the GPS Receiver. 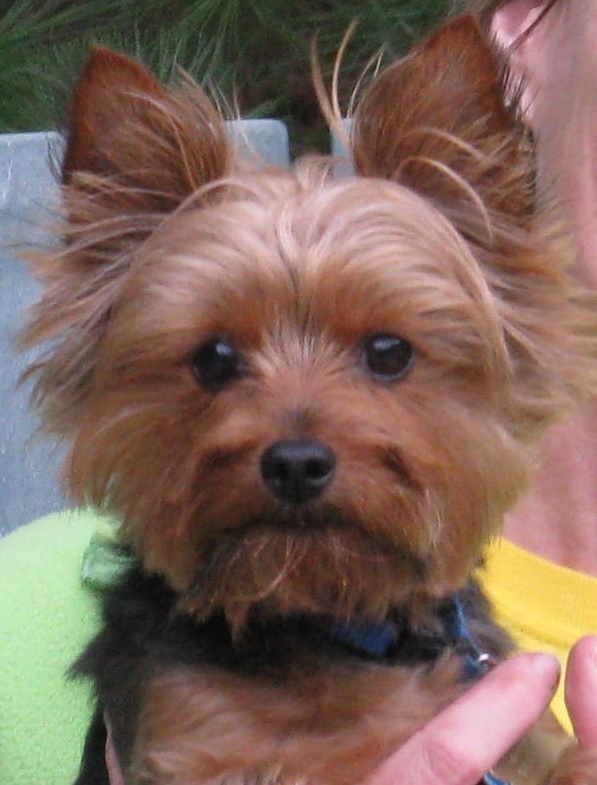 Washing the vehicle can be done at any conveniently located car wash.
Spencer (a Yorkshire TERROR) enjoys going to work and sleeping in the van. All his toys and comforts from home are included. 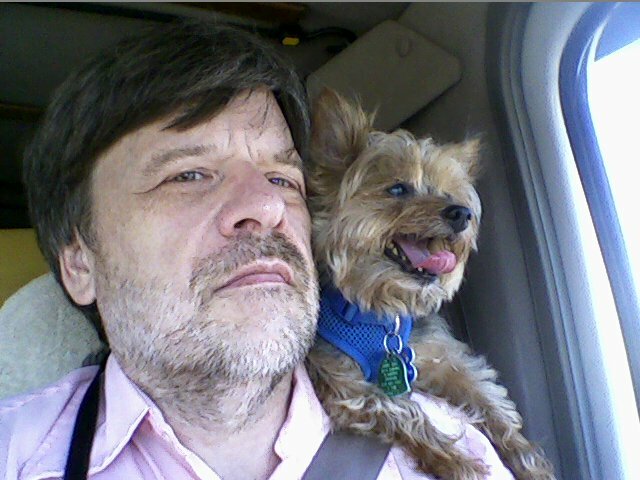 Below is a photo of the author and Spencer. 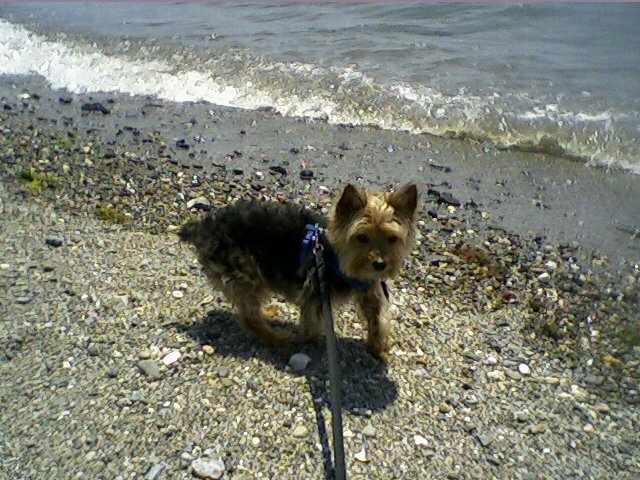 Notice the harness and leash to keep Spencer safe and secure. 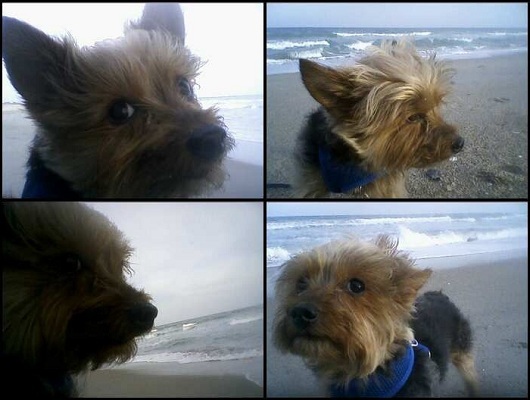 Below are photos of Spencer watching me while I work from my desk at Goodrich Power Systems in Twinsburg, Ohio. Employees at the client company enjoy taking Spencer for walks during their break and bringing him carrots, his favorite treat. Notice Spencer on the large soft blanket that covers the dashboard as well as the steering wheel to prevent Spencer from possibly falling onto or into the steering wheel and being harmed. Low Cost Luxury Living is maximized by avoiding other high costs of living. Health Care costs are very high and will continue to rise. Therefore, consuming healthy foods (e.g. being Vegan) and getting plenty of exercise (e.g. maintaining your vehicle) will contribute greatly to your health and happiness and to live a long life of low cost luxury. Auto Care costs are also high. Performing your own repairs (and maintenance) will save you a great deal and provide you with an enormous amount of personal satisfaction and confidence in your ability to effectively and efficiently live a life of low cost luxury. Do you see Spencer's pal Goliath in the photo above? Other projects are presented at The Projects. Other activities that Goliath and Spencer are featured in are available on the web site SpareTimeActivities.net. "We are self-sufficient, intelligent, and brave."